Yesterday consisted of a lot of running around town in the pouring rain, chauffeuring kids and doing multiple errands. 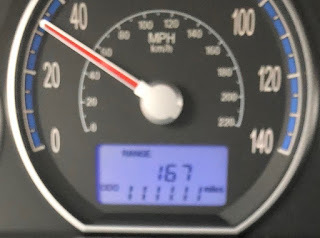 During that time, the Odometer decided to hit a numerically interesting number. Picture was taken by sidekick that I was chauffeuring around at the time while I was driving. Ain't you suppose to be driving faster...? That was at the speed limit on that stretch of road, and I'm very law-abiding. That's only 63 miles! Your car is practically new!